"Frying this chicken has nothing to do with my chicken tractor so don’t think I have suddenly got a chicken freak going on." You're killing me again!! LMAO!! You don't even HAVE the chickens yet and you're already thinking of frying them! Poor little chickens. And really, "a movable chicken coop designed for free range chickens". Come on, Wreg, a chicken in a coop is NOT a FREE RANGE chicken. Technically my chickens will be “protected” free range chickens. We have so many predators here like various raptors, coyotes, fox both red and gray, dogs etc that they need protection. So the chickens will be organic like free range, they will have fresh yard to move about daily (hence the portability of the coop) like free range except they will not be allowed to roam the range freely like a free range chicken. Gigi will not allow the slaughter of any chickens. I have not determined what I will do with these hens after their 2 ½ year laying expectancy. I could let them run free but then the neighbors would have something to say. I know a fellow that is willing to take them and what he does later is none of my business. Plus I don’t seriously think I could kill them either unless I was starving. Who am I kidding…I am sure Gigi will buy bags of Purina Chicken Chow, little bracelets and sweaters….she is already looking at chicken feeders and waterers in the farm tek catalog. 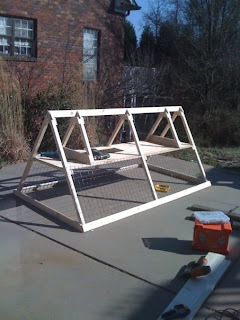 I'm still in awe of the fact that you go from, "I might like to raise chickens" to "I'm building a chicken tractor." Thunder Dome - Fox News was running a feature yesterday about the worst-case scenario! It was great!